This type of Discount can be applied per account and per product, within a specific period of time. Volume Discounts are used when the customer purchases a certain quantity of the specific product you discount. 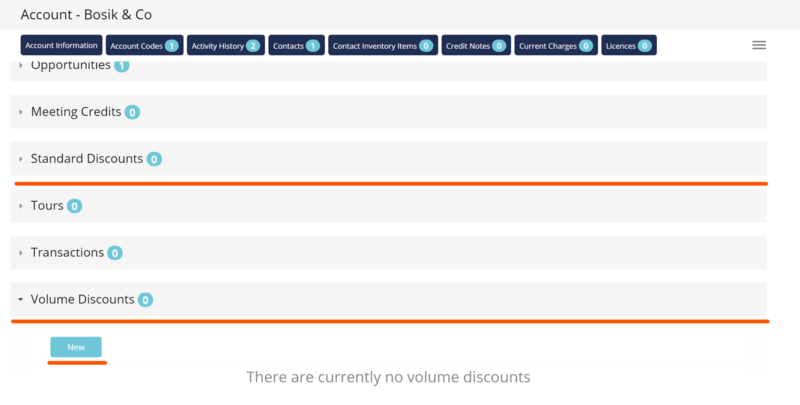 Both Standard and Volume Discounts will only take effect within the selected period of time, both when charging the customer from within Operate's backend and when the customer purchases from the Portal/ When using the Portal, the discount applies automatically, without the need for the customer to take any action. Go to Member > Accounts and find the customer for whom you need to apply the discount. Scroll down to Standard Discounts or Volume Discounts respectively, click New, then configure the parameters (product, discount, period) as shown in this article.. When you charge your customer for the selected product, as long as the charge is made within the selected discount period of time, the price of the product will automatically adjust to the discounted one. The same occurs when your customer buys that product through the Portal. Go to Membre > Accounts and select the customer to whom you need to apply the credits. Scroll down to Meeting Credits and condigure them as shown here. When you make a booking within the period set on the meeting credits, the price will automatically be discounted. This is also automatic when your customer books on the Portal. Bookings to which a dscount has been applied using Meeting Credits will be marked as discounted within your Calendar. The two Discount columns will display the amount of hours and the percentage or amount of discount applied. Once the amount of hours are used up or the credit period expires, your customer will be charges the regular rate, according to your product configuration. Meeting Packages allow you to create a monthly allocation of free hours against different meeting rooms for a member. While Meeting Credits apply to all products within the selected group, Meeting Packages apply to a specific room you can select. The Meeting Package creation process is described here. Once the allocation is used within a month, the member will then be charged for any additional hours, according to the product configuration. Meeting Packages cannot be used for a member who already has discounts against meeting room rates, such as Meeting Credits. Go to Settings > General > Customize > Calendar > Meeting Packages. Create your package as described here. Go to Member > Accounts and select the customer to whom you want to apply the package. On the Account page, you can select a Meeting Package from the dedicated dropdown. Once the package is applied, the allocation will be available when the customer is charged for a booking via Operate's backend or when the customer make a Portal booking. The price will automatically adjust according to the applied package and the Calendar will mark the booking as discounted, in the same manner as it does for Meeting Credits. Promo Codes are a way to provide a limited amount of discounts to your customers, for a specific amount of time. When a customer enters a Promo Code at the Check Out, the discount will apply to the main product on the package e.g. the membership, virtual service but not to additional products or setup fee and deposit. The customer needs to first be made aware of the Promo Code itself, then they need to apply it when checking out on your Portal. Go to Portal > Promo Codes and set up your code according to the steps provided here. Choose a way to send the code to your customers: you can email specific customers, for example, and provide the code to them directly. 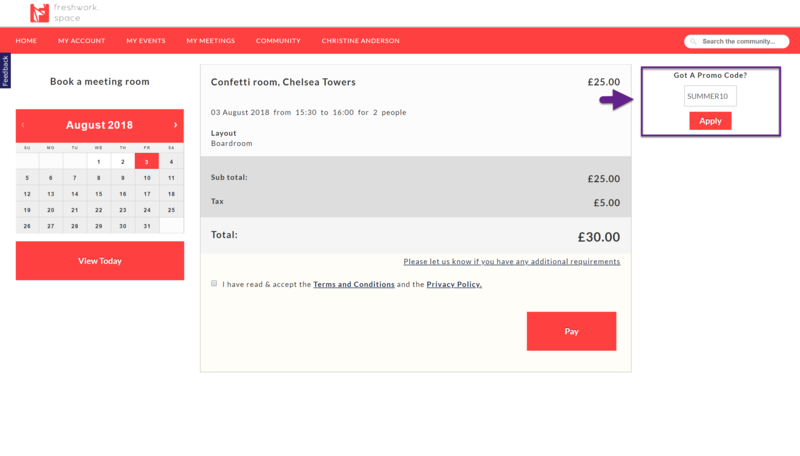 When customers book a room on your Portal, they can simply enter the code into the dedicated field on the right, then their main product (e,g. 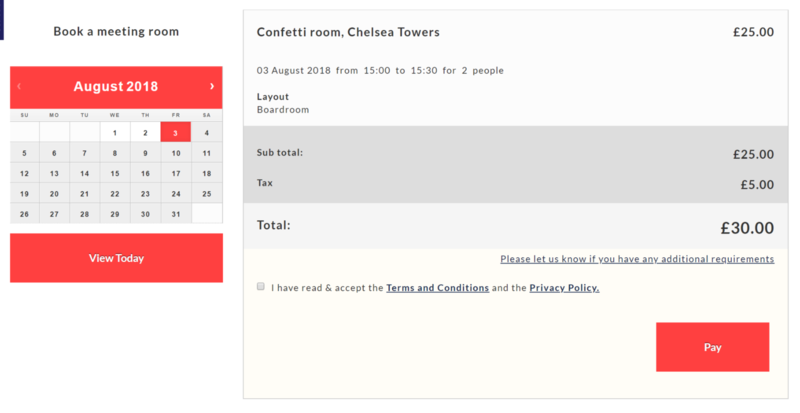 the meeting room) will be discounted by the percentage or amount you have configured. Please note that if there is no active Promo Code, the Portal will not display the field.